Thanks for posting this and the update. 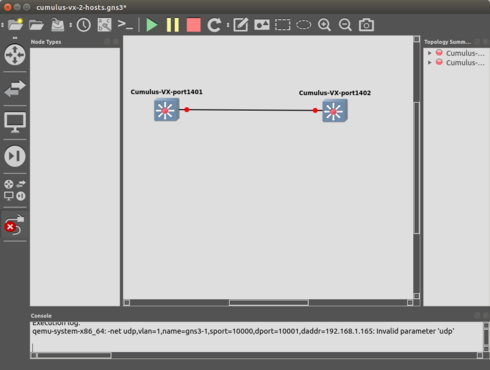 Please Let me know what comes from the report with GNS3. I am actively interested in this flow. Keep this stuff coming, Will, this is great. 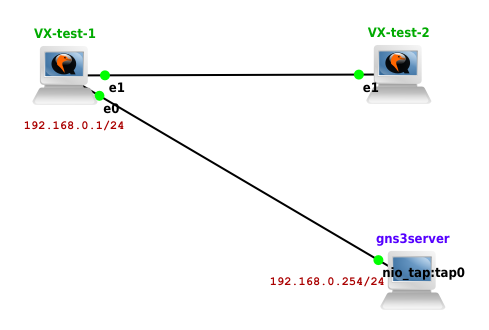 And let me know if anything here needs to be updated in the docs (even if it means calling out a GNS3 issue). Thanks! Do I need some special version of QEMU that supports the "-net udp,..." syntax? Will, have you seen this post? I did see that on the bug and he also marked it for the new release(1.4). Will keep eyes on it. Looks like recent version of Qemu do not understand the -udp parameter anymore. Need to investigate this more. Alternatively, you can use virtio-net-pci network adapter type instead and not use the "legacy networking mode"
Is there a way we could work with the appropriate resource there at Cumulus to get the VX VM to allow SSH access without using "legacy networking mode"? I have pinged the team internally and hopefully it will spark something. We will keep you updated. Thanks! So, the "-net udp,..." syntax was never valid in mainline QEMU. You have to use the "-netdev socket,...,udp=..." syntax, which was added back in QEMU 1.1 to support UDP tunnels. It only worked if you patched the official QEMU source with a GNS3-curated patch set that supported the "-net udp,..." syntax and then built a custom QEMU; see http://www.braindeadprojects.com/blog/what/gns3-and-gentoo-fixing-qemu-networking/ for historical details. The VX "Using GNS3 with QEMU and KVM Virtual Machines" doc currently specifies in step 4 to "Check the 'Use the legacy networking mode' check box." This is mainly to allow SSH'ing to the VX box, which sadly is not set up for serial console access (this really should be enabled by default on VX - please!!) and so SSH is the only way in (not really, if you allow the QEMU console to be displayed, but for most folks this would be turned off.) 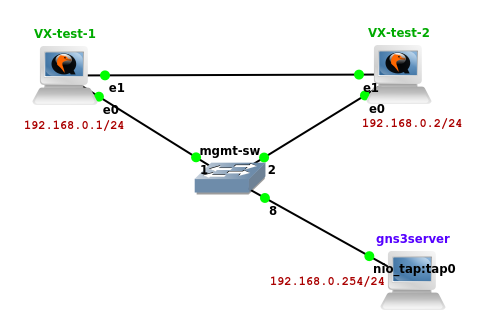 However, due to the way GNS3 utilizes QEMU "legacy mode" and the history of GNS3 / QEMU integration, this causes the formation of incorrect syntax when forming the inter-VM links in GNS3. The "vlan=0" parameter implemented a virtual ethernet hub, in which any other -net interface with "vlan=0" was virtually connected to. So, the "-net user,..." line above allows the forwarding of traffic sent to the host TCP port 1401 to the VX NIC with the "vlan=0" tag, namely eth0, TCP port 22 (SSH.). Also, the "net=" in that line declares a IP subnet to which QEMU will provide DHCP service to, which also causes the eth0 NIC in VX to get an IP address (typically 192.168.0.15 from what I've seen.) And so, this is why (for this example) if one types "ssh -p 1401 cumulus@localhost" you get a SSH connection to the VX host, which it sees as coming in to 192.168.0.15:22, namely SSH on eth0. The problem being, as we've found out, that mainline QEMU never had a "-net udp,..." construct. OK. But what if we UNcheck "legacy mode"? to the end of the first "-device" line, which correlates to the VX VM's eth0 interface. Cumulus VX (TM) is an open-source LINUX (R) distribution. License files are included with every package installed in the system and can be viewed in the /usr/share/*/doc/copyright files. The registered trademark Linux (R) is used pursuant to a sub-license from LMI, the exclusive licensee of Linus Torvalds, owner of the mark on a world-wide basis.